Many crayfish species have been introduced to novel habitats worldwide, often threatening extinction of native species. Here we investigate competitive interactions and parasite infections in the native Austropotamobius pallipes and the invasive Pacifastacus leniusculus from single and mixed species populations in the UK. We found A. pallipes individuals to be significantly smaller in mixed compared to single species populations; conversely P. leniusculus individuals were larger in mixed than in single species populations. Our data provide no support for reproductive interference as a mechanism of competitive displacement and instead suggest competitive exclusion of A. pallipes from refuges by P. leniusculus leading to differential predation. We screened 52 P. leniusculus and 12 A. pallipes for microsporidian infection using PCR. We present the first molecular confirmation of Thelohania contejeani in the native A. pallipes; in addition, we provide the first evidence for T. contejeani in the invasive P. leniusculus. Three novel parasite sequences were also isolated from P. leniusculus with an overall prevalence of microsporidian infection of 38% within this species; we discuss the identity of and the similarity between these three novel sequences. We also screened a subset of fifteen P. leniusculus and three A. pallipes for Aphanomyces astaci, the causative agent of crayfish plague and for the protistan crayfish parasite Psorospermium haeckeli. We found no evidence for infection by either agent in any of the crayfish screened. 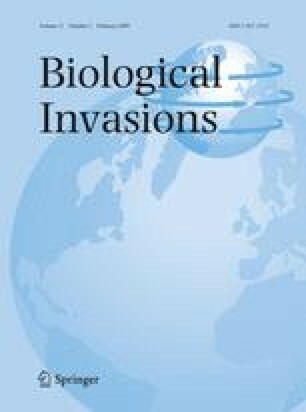 The high prevalence of microsporidian parasites and occurrence of shared T. contejeani infection lead us to propose that future studies should consider the impact of these parasites on native and invasive host fitness and their potential effects upon the dynamics of native-invader systems. Stephanie Peay provided advice and help with fieldwork. Qiu Yang provided advice and assistance for the molecular work. Elizabeth Moodie provided positive control material in the form of microsporidian infected crayfish muscle. Fieldwork was carried out under licence from English Nature.